If you have kids, a noisy husband or are a nursing mother, this Sunday School class is for you. For the last two years I have had the wonderful pleasure of teaching a Sunday School designed specifically for parents of toddlers. The class is open to everyone, and there is a handful of individuals and couples without kids, but it is structured specifically for those who have active children too young to attend nursery or primary. My hope in structuring the class is to provide a living room–type classroom experience. Parents are encouraged to let their kids roam and play. If kids become antsy or upset, parents can attend to their needs right there in class. Over the last two years, we have had many diaper changes, had crying babies and nursing mothers. All is welcome and encouraged. This is an environment where mothers and fathers never need to be concerned with a distracting child or that they are interrupting others' spiritual experience. We have proven reverence doesn't equal silence. This Sunday School has been a welcomed refuge for mothers and fathers with young children who have traditionally felt banished to walking the halls or hiding out in nursing rooms when their children have become inconsolable. There is never a need to leave this classroom. Everyone who attends knows what to expect from the environment. Parents never need to be concerned that their fussy baby or roaming child is a distraction to another. Now the foyer couches, hallways and nursing rooms are empty and the classroom is always full. By providing this open, comfortable — and in a lot of ways safe — environment, I have heard the thankful relief from the spiritually-craving mother who once felt torn from either being spiritually fed or feeding their baby. Now she feels she can do both. Additionally, class participation is never an issue. I have taught Sunday School on and off for over 15 years, and this is the first time I've actually never encouraged the class to bring or open their scriptures. You'll never need to feel concerned that you'll be caught unprepared or called on to read out of your scriptures. With a bottle in one hand and a baby in the other, my hope is that you will not feel you have to put down the bottle to reach for the scriptures. Therefore, I present every lesson on a screen. Each quote, scripture and video is easily seen by everyone. Even if your hands are full tending to your parental duties, you can follow along, read and not feel you lost your spot in the lesson while tending to your child's needs. 1. Seek the individual needs of the parents. Pray over each family to understand their gospel needs and how it can be addressed in the lesson. 2. Become comfortable with noise. Learn how to talk through the noise. Avoid getting louder or waiting till the noise subsides. Getting louder or silencing can make parents feel they are disrupting the class. Do your best to stay on point and continue the lesson as though the noise was not present. 3. Prepare and use PowerPoint, Google Presentation or slide presentation. Use technology in a meaningful way, but keep it simple. Refer to my Sunday School Class slides for an example of how to use media in the class. When the idea for the class was inspired, some perceived the class as a form of punishment, where the "Hallway Parents" were assigned to attend. It could potentially even reinforce the idea that parents with children don't belong in "normal" Sunday School class because it disrupts the Spirit. Fortunately, our bishop did a wonderful job at reminding the congregation each week in a loving way that there was this new class designed to meet the needs of those with toddlers. 5. Eliminate shame in class. Like number 4, continue that love and admiration of your ward family and bring it into the class each week. Be mindful to remind everyone the nature of the class: that they never need to leave with their child or feel bad that their child is noisy. 6. Make the lesson applicable to their lives. This point is essential for any class you teach, but I believe more so for a class of young parents who are distracted with children. They come for nourishment in the gospel of Jesus Christ. As tempting as it may be to lecture a scholarly presentation with PowerPoint or rattle the lesson off point by point as outlined, don't! I am not suggesting "dumbing down" the lesson. We have had amazing, profound discussions over the last couple years. But remember these are parents juggling kids, listening through the noise, thinking about the week full of activities. Keep the slides simple but meaningful. I have found it much more useful to present a thought-provoking 1-4 sentence quote rather than a 10-15 verse reading of the scriptures or detailing of historical events or scholarly perspectives. 7. Make sure you have more than enough room! This is critical. After a year of a very successful Spirit-filled noisy Sunday School, our ward had a schedule change. We were moved from a large room that was packed each week to a room that was about half its size. We didn't lose half the class; we lost almost all the class. With the room change, if we were to set the class up like a traditional class we could fit everyone in. But doing so would not allow parents space to feel comfortable in letting their kids roam. Parents couldn't stand and soothe their crying kids without being in the way of other parents. As a result, families were again in the halls and nursing rooms. 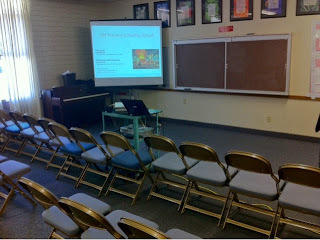 Fortunately, we were able to remedy the issue — the bishop assigned us a new, much larger room. This has been one of the most rewarding callings I have ever had. Our bishop was truly inspired when he identified the need for a Sunday School class like this. Over the last two years, we have had many visitors who deeply appreciated the class and wished they had one in their home ward. I hope that these ideas can be used to bring a successful Noisy Sunday School class to your ward.